Faith in Jesus Christ and in the Church he founded, remains the essential, positive, free-will response to God’s grace. …The ultimate rejection of God by the Jews was the rejection and murder of their own Messiah – Jesus of Nazareth. Israel as the People of God – Part One: Who is a Jew? Sungenis to USCCB: The God of Judaism is not the God of Christianity. The USCCB is trying to give the impression that since Jesus obeyed the Torah and was circumcised, then those Jewish beliefs can be practiced by Jews after Jesus, and especially because Jesus did not abrogate the Torah. This is a clever argument, but it won’t work. Jesus lived the prescriptions of the Torah and did not abrogate them because Jesus lived on the Old Testament side of the Cross, and as such, he was required to obey all its precepts and not do away with them (unless, of course, Jesus reminded the Jews of a higher law of God that came before the Mosaic law, such as Jesus’ treatment of the Mosaic divorce law in Matthew 19:1‐9). But after Jesus died and rose again, the Old Covenant he lived under was indeed abrogated and replaced by the New Covenant. That fact is precisely why the veil of the Temple was miraculously torn in two the moment Jesus died. It signified the legal end of the Jewish religion. Jews may have continued to practice their religion after the Cross, but it had no legal or covenantal standing with God. Why the Sadducees didn’t believe in the Resurrection … and how Jesus set them straight! Then why does God in Exodus identify himself as the God of Abraham, Isaac and Jacob, all of whom have been dead (for hundreds of) years? How can he call himself their God if they are dead? Hence Jesus dispatches their view. For us the point is to see how forcefully and clearly Jesus upholds the fact that the dead are alive in the Lord. He powerfully asserts an essential doctrine of the Church and we should rejoice at how firmly Jesus rebukes their disbelief in the resurrection of the dead. Rejoice! For your loved ones are alive before God . To this world they may seem dead, but Jesus tells us firmly and clearly today, they live. Likewise we too, who will face physical death will also live on. Let the world ridicule this, but hear what Jesus says and how he easily dispatches them. Though ridiculed, the resurrection is real. 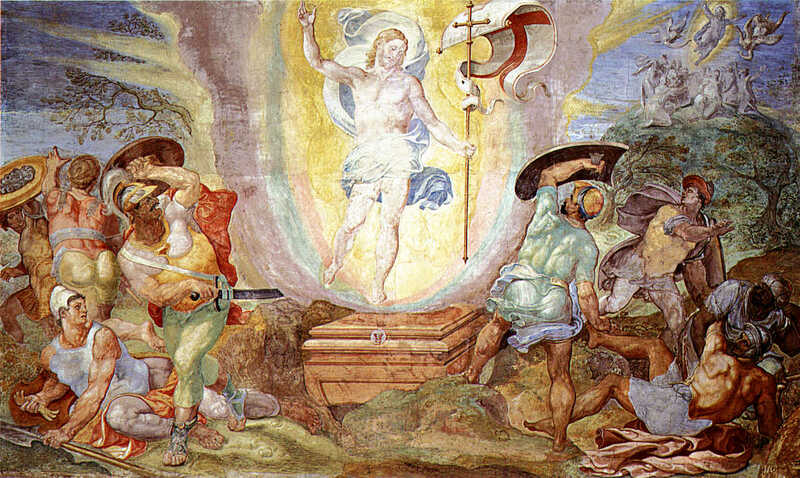 Editor’s note: There are many living today who do not believe in the resurrection of the body, let alone that Jesus Christ rose again from the dead. The Catholic Church, along with 2000 years of systematic Catholic scholarship and superb theology, and the most successful philosophy of life that the world has ever known, remains the living the eye-witness to the truth of the Gospels, until Jesus comes again. Those who, for whatever reason, fail to participate fully in all of the work, worship, sacraments and devotions of the Catholic Church have a lot in common with the Sadducees. And that’s just … sad! The path to Orthodoxy is long and labyrinthine. Does G-d exist? Did He give the Torah? Did He also provide an oral tradition? Like many Jews rediscovering their heritage, I had to confront and resolve each of these challenges. Eventually, we pre-ba’alei tshuva arrive at the denominational crossroads. Convinced of the Torah’s Divine origin and aware that, to be decipherable, the Pentateuch must have been given with an oral explanation, I sought the Jewish movement in possession of that ancient Mesorah. Seen on the web: “Torah” – “Tanakh” – “Word of God” – What’s the difference? “I would not use the word “Torah” for the entire Word of God because that could cause some confusion. The Bible itself refers to the first five books as the “Torah of Moses” and the whole Jewish Old Testament is called Tanakh meaning Torah (Law), Nevaiim (Prophets) and Kethuvim (Writings).